whose golden autumn eyes makes this heart smile! an inglenook blaze rolling through the hills, poaching twilight. whose nurturing affection fosters impassioned emotions. of his heart and mind. all of the emotions that I feel. reveal, embrace and be understood. reflect on our lives, loves, and friends. on work to be done during this rite of drum. my end result will mirror individual effort. You’ll be in my heart then too. Reach deep into my soul. But my body is exhilarated! And now it isn’t at all…. Snug in my favorite chair. Against a moonlit, November night sky. The wood stoves of my youth. Relaxed smile on your face. Theology, politics or growing up. Got smarter, as I got older. Receiving my daily dose of hugs and encouragement. White caps peaking the closer you get. And rest on the sand. I watched him over the weeks I was there, tirelessly making his rounds, stopping to check on patients, not just their physical conditions but their mental health as well. Did the families have everything they needed? Did they have access to all the institutions that could benefit them in this, their hardest time? Was the wife or mother getting enough sleep? His patients were his life, bringing him pictures of their dogs and cats, school friends and relatives; he was an extension of their families. He celebrated birthdays and holidays, their recuperations and even small steps in progress to a better , healthier life. He grieved with them too, in their times of loss or setbacks; this would be his undoing. my hand that fells you to the ground. summers first crack of lightning. warm me on cold winter nights. more precious and rare with age. I never thought about “mid life;” age has not been a tangible concept for me. I work out, am in fairly good shape, healthy, and at close to forty feel pretty good over all. I am married to a wonderful man and great father. I have two active, intelligent, school age children, and am fortunate to be with them full time insuring, to my satisfaction, their childhood security and happiness. One day, however, as my best friend Nancy describes it, my euphoria seemed to hit a brick wall. My youngest was in elementary school full time, and the need for mom’s around the clock attention was waning. My good friend and neighbor moved away, and other mothers were back to work, so I did the sensible thing and took some college courses to prepare myself for the day I too might return to the civilized world of adult interactions, and let us not forget the almighty paycheck. Petrified of re-entering the school arena, I was pleased with how many brain cells had not been caricatured to format Nick Jr. or Maryland Public Television. Writing, which had been my worst nightmare earlier in life, became my way of telling the outside world a viable adult still resided in an entity that knew more about Main Street USA in Disney World than Pennsylvania Avenue in Washington DC. Words flooded pages expressing concealed emotions about friendship, love, and rediscovery of myself. This was the scary part, for beneath the inner workings of my “perfect life,” lay dormant the youthful, energetic, dreamer whose spontaneity had been put on hold while adhering to the rules of parenting; scheduling is everything. Emerging slowly, with the help of a mentor, was that of a woman who would become more than the sum of her children and dreams of their futures. Once upon a time, it may have been believed that when you become a parent your life ends so as to promote that of your family’s. In today’s world, life at thirty-eight is a second chance to become, what I didn’t know I even had in me. 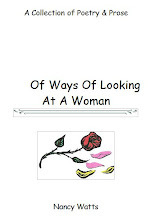 Of Ways Of Looking At A Woman represents a journey for me, one of insight to the deepest crevices of my soul. While writing, I am allowed to revisit the beauty in my life, but too must face many demons. I relive passion, intimacy, love and desire combined with failures, rejection, and loss. My ability to recreate the pain is the most rewarding, for it is the most healing. Putting into words that which is sometimes unspeakable, somehow deadens or numbs the nerves. The loss of a loved one, for example, may never leave you, but identifying it can bring understanding and acceptance. My goal in sharing my poetry is to help you, the reader, connect your feelings of pain and joy with that of someone else. I have been known to search hours on end for just the right card, expressing the exact thoughts and feelings as my own. That connection, that knowing, someone else feels the same, is somehow irreplaceable. I stood in the shower. Beads of steaming hot water pelted my back like ammunition to numb the pain. It sounded as if the heavens had opened up in the midst of a downpour. The kind of rain you hear playing a tune on your roof during a thunderstorm while snuggled in your bed. And the floodgates of my mind opened as my body began its full release; every muscle went limp. Memories, fluid like water and tears, were washing away. The way your eyes connected to mine, and the feelings of you; the taste of your lips, and the presence of your body in mine, were all slipping through my fingers as the soap glided along. How I longed to be snug again in my bed; in my room filled with dream catchers to sift out my nightmares and leave behind once welcomed fantasies of lying on a beach blanket soaking up the suns radiant glow. But the water runs cold and the step into reality is cushioned by red shag. What’s left of my memories are soaked up in cotton and wrapped around me as a fading reminder….